Please advise which is the better scope option for a tall 188cm male such as myself. I would like to buy a scope. I should use a tripod I suppose. Perhaps sitting in the doorway of my tent (backside on the edge of my sleeping mat) is the most likely place I will set up my tripod. I will view birds in any national park or forest location and look for any type of bird. I was wondering which of the types of scope (straight or angled) would be the best for this type of watching. I will hike to the location carry all my gear (tent, scope, food, etc) because I don't own a car. I hope this info gives a good idea of what I plan to do with my scope and how I will most likely use it. Straight or angled any advice much appreciated. I used to think straight was better, and I did own a straight Swaro HD65. I then borrowed an angled Swaro HD80 and I found I like angled better. The moral of the story being, if you can borrow some scopes and try them (just concentrate on how they feel is they are different models, the optics would obviously be different), you would be ahead of the game. the only two occasions where I would consider a straight scope are sitting in a hide all day with the scope on a hide clamp or using the scope inside a car. Considering your height, getting a straight scope to your eye level while standing means you need a quite tall tripod with the column fully extended - not great for stability. I'd strongly suggest an angled ED50 with either 16x wide or the zoom if you are using in a forest environment - lightweight, bright, sharp and pretty robust. Velbon luxi tripod also idea for a lightweight support. You'll need a shorter, lighter tripod than with a straight scope. For looking up, as in the forest, the angled scope will be more comfortable. If sharing the scope with others that aren't your height, the angled scope will require far less tripod adjustment. Scott's Miracle Grow KILLING Birds, for Years! Thanks everyone for their reply. I have looked at the Nikon fieldscopes. I think the ED50 is a good recommendation. Very light weight which is welcome. I was wondering about which eyepiece would be best. Perhaps the 13-30x/20-45x/25-56x MC zoom. Is 13-30 better than 20-45 at allowing light to reach thhe exit pupil? I'm not sure I will need much more than 30 magnificatgion because I'm hoping to do some digiscoping with the ED50 and I've heard that about x30 is great for digiscoping. I wouldn't mind getting a fixed focal length eypiece either and was wondering what people might recommend. It's the same zoom but the magnification depends upon which ED Fieldscope you attach it too. With the ED50 the range is declared at x 13 - x 30. The other figures are for the 60 and 82mm bodies respectively. Thanks. That's very helpful. Di you think 13x30 is a suitable magnification ir should I consider getting more? I'm happy with the ED50 as an objective lens. The weight is so good. Definitly angled for your use. For the ED50, I'd recommend fixed magnification wide angle eypiece, rather than zoom. The wide field makes a big difference for finding stuff, which is espially important in forest. The 16x is great in forest, if the distance is not too high. The 27x is great for open areas, wetlands and coast. More than that does not really make sense with the small scope. Both 16x and 27x exist as DS version for digiscoping or MC version with eyecup, but both are usable for normal viewing. Thanks for very helpful reply. I also think wide viewing is important. I live in Sarawak, Borneo. Across the road from my house is some destroyed forest (nearly all "forest" in Borneo is destroyed quite substantially these days). It is populated by small fast moving birds. One which can be seen rarely is an astonishing red colour like I've never seen before in my life. Amazing. 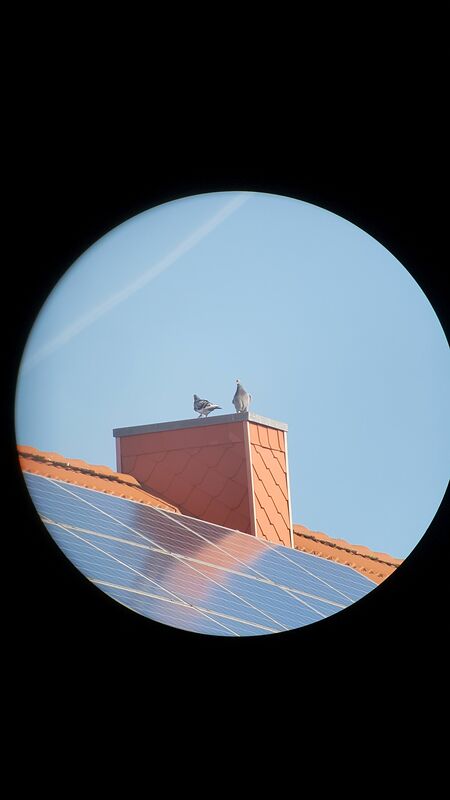 But these birds move fast and it would help to have wide viewing with longer than 8x32 (my canon binoculars) range. In these conditions it's not really possible to view birds over long distances due to small size and trees getting in the way. I've figured out that the birds always seem to be present in the same locations. Therefore it's best if I find a good spot and plant myself there and cross my fingers that a bird I want to spot lands on a suitable branch. Is this the correct method of birdwatching? Anyway, it would seem that fixed focal length would be adequate for this strategy. Am I on the right track? Also, I was planning to use a small folding stool and a tiny tripod. But I was wondering if it was also possible to use the straight version of the ED50 with the x27 wide fixed eyepiece hand-held? Possible? I just bought ED50 angled with DS 27x fixed eyepiece. It's quite perfect compromise for bird identification. There are lots and lots of discussion of ED50 and suitable eyepieces in the Nikon subforum. I also bought Rangers tripod with ballhead and the combo weights only 2 kg and goes in the small space. You mention there are DS versions and MC versions. I couldn't find anything about that on Nikon's site for these eyepieces. Anyway, it's good to know. I think I should get the DS version. But are there any disadvantages to getting the DS version compared to the MC version for normal viewing only? I'm interested in the UT-3AR version of this which is only 780 grams. Yes it's light but would it be suitable for forest type spotting? I have a vision of myself doing most of my scoping in a seated position, so the tripod would be extended to mid-height. It would be possible to move the extender center post up and down. I've never used a tripod before so I don't know much. My gut instinct still tells me that a small straight scope would be suitable. But I'm guessing. Also, is it possible to use the ED50 x16 fixed hand-held? Therefore it's best if I find a good spot and plant myself there and cross my fingers that a bird I want to spot lands on a suitable branch. Is this the correct method of birdwatching? Sounds like a good way, although of course there is not only one correct method of birdwatching Sitting still and waiting for the birds to come, or moving around and searching for birds both works fine, up to you to do as you prefer. I tried 27x on the ED50 handheld, it works somewhat but I did not find it much fun. I usually use a tripod, sometimes a monopod. If you don't like a tripod, why not try a higher powered stablised bin, e.g. the Canon 15x or 18x? I think for your type of use this should be quite ok. I use the earlier version of this tripod with my ED50 (or the monopod Super8 when traveling light) and have been pleased with it. It is a little slower to extend than the external led lock designs, but the weight savings is well worth it. Incidentally, the ED50x16 is easily hand held, especially if fitted with the Stay On case that Nikon offers (a Cley Spy design I believe), which includes a convenient side grip handle. For the Fieldscopes, Nikon used to have MC and DS versions for some of the wide angled eyepieces. It may be that not all of those are awaylable any more, as most are out of production now I think. DS and MC are identically optically, the MC has adjustable eyecups, while the DC doesn't. I have a 16x DS and a 27x MC, and I got quickly used to both... If you can, get the MC, but if only DS is available, that should work just fine. I have a vision of myself doing most of my scoping in a seated position, so the tripod would be extended to mid-height. It would be possible to move the extender center post up and down. I've never used a tripod before so I don't know much. My gut instinct still tells me that a small straight scope would be suitable. But I'm guessing. Also, is it possible to use the ED50 x16 fixed hand-held? I think it would be much more convenient to use an angled scope when sitting in front of a tripod. Not only does the angle help you to look up more easily, but it's also much easier to adjust one's head position to a new viewing angle than with a straight scope, where you'd have to re-adjust extension heigh with each change. With regard to hand-held use, I have both a straight and an angled body for my ED50. I thought the straight one with the stay-on case with hand loop would be great for viewing shorebirds at long ranges, but I have to admit that the combination of monocular view, and large magnification with resulting enlarged shake makes it no more effective at 13x than my 8 x 42 binoculars. While the picture shows the straight version, I found that the angled version is even more convenient to use with the shoulder stock for some reason. So I'd think that for your primary application of using the scope from a tripod, angled probably would be better. For the secondary application, using it hand-held, straight might seem like a good idea, but in my opinion it only makes sense with a shoulder-stock, and then angled is as good or better. The main reason to pick a straight scope is usually if you're birding out of a car window. I've also heard one birder saying that he likes it better when looking down from observation towers, which makes sense too. By the way, you can also mount binoculars on a tripod - the image really gains a lot from steadiness. That might be a way of trying out your original idea and the ergonomics of "straight" optics. With regard to the eyepiece, I have the 13-30 zoom. I would agree with Dalat that for your application, a fixed eyepiece with a larger field of view would be the better choice. the Velbon tripod mentioned above is 135cm with column extended and 118cm with column down. No chance of using while standing - sitting down it's probably ok. The ballhead could actually work with a light 50mm scope. As for angled vs straight - even if you build a shoulder stock to use an ED50 (or some other 50mm scope) hand-held at low magnification, an angled one is better - less neckache. Other options in 50mm would be the Kowa 501 (very cheap, very light and surprisingly good view - non-changeable 20-40x zoom though which is of course narrower than a wide angle fixed EP at the low end) or the Opticron MM3 ED or MM4 50mm models (cheaper and slightly heavier than Nikon, wide angle low mag EPs availble and also zoom EPs). The above reply mentions a difference between DS and MC eyepieces available for the ED50. I wear cheap plastic 1.5 magnification eyeglasses on the end of my nose for reading and I've rolled back the rubber eye-cups on my 8x32 canon binoculars and they work much better with my reading glasses. Is it the case that the DS x16 version eyepiece would not be that good for use with glasses because there is no way of adjusting the eye-relief? I suppose the MC x20 wide eyepiece has some type of adjustable cup. If that is right I would probably get the MC x20 wide instead but then would be stuck for digiscoping. Perhaps I'll need to get both? I wouldn't worry too much about digiscoping at first. Digicoping works best on well-lighted stationary birds, and your primary application doesn't seem to offer that kind of subjects. Additionally, I'd think that it's possible to take good shots through any of these oculars, even if one might be the overall best choice for digiscoping. Low magnifications will leave you with some vignetting, while using the digital zoom will ameliorate it (at the cost of reduced resolution). So you can try your hand at digiscoping with about any eyepiece, and if you like the activity, still decide to get a "dedicated" digicoping eyepiece later. Digiscoping requires a solid set-up, so is better suited for a large scope on a strong tripod. Small scopes on light tripods are too flimsy for good digiscopy. It may still work for record shots of course, but I think in a forest environment (where birds are not that far away and are constantly on the move), you are much better served with a bridge camera. The DS eyepiece may work just fine with glasses, but of course you need to try to be certain. Thanks Henning. I've taken that onboard. The fact that I can have a stab at digiscoping using the x20MC is good enough for me. I'll avoid the x16DS version because I'm worried it might not work with my specs. I also like the idea of a very basic and light setup to start off. ED50 + MC x20 wide eyepiece + Velbon UT-3AR tripod. The lower price also helps. The DS eyepieces work well with eyeglasses. I have the 30X, 50X and 75X DS eyepieces and the 30X has the most comfortable eye relief but they all work. Specific eye relief values are here and, to my eyes, the values are accurate.